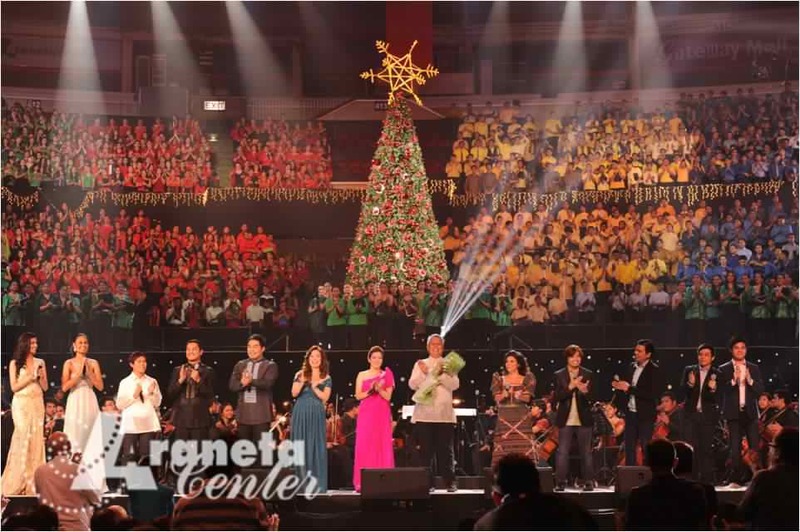 The Araneta Center Christmas Special Enchants Pinoys! 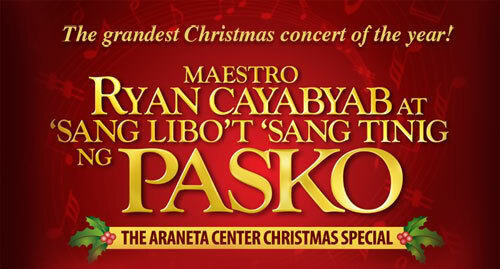 The Araneta Center gave its loyal patrons an early Christmas gift this year, The Event titled Maestro Ryan Cayabyab at 'Sanlibo't Isang Tinig ng Pasko : The Araneta Center Christmas Special was held at the Smart-Araneta Coliseum last November 19, 2011. I was lucky enough to receive invites to this exclusive event courtesy of our good friends from The Araneta Center. The Event was basically a dream blurted out by Maestro Ryan Cayabyab in one TV interview that His dream is to do a concert consisting of one thousand voices and no other venue could hold that amount of performers but the Smart-Araneta Coliseum, fortunately, The Araneta Management saw his interview and so the event was pushed. Award Winning Choirs from different groups and different parts of Luzon, Visayas & Mindanao, all flew in to the Smart-Araneta Coliseum to participate in the grandest Christmas Concert by the Araneta Center, all dressed in Christmas colors and was seated in one side of the dome, filling up the seats from Lower box to Upper Box B! -- They are collectively known as the 1000 Voices Choir. The 1000 Voices choir was made even more grand with the sixty-piece orchestra to go along with their beautiful and angelic voices singing our favorite Christmas pieces. All of them conducted by Maestro Ryan Cayabyab. The event was hosted by Miss Universe Finalist Ms. Venus Raj & Ms. Shamcey Supsup who both did a great job keeping the audience on their feet all throughout the special event at the Big Dome. The Disney Legend Ms. Lea Salonga also sang along with the 1000 voices choir and sixty-piece orchestra in a grand musical number that made the event more magical. The Two-hour long Christmas special ended in a big production number with all the guests artists and the 1000 voices choir together with the sixty-piece orchestra sang our Classic Filipino Christmas Melodies while the whole Smart-Araneta Coliseum crowd was singing along. The Maestro Ryan Cayabyab at 'Sanlibo't 'sang Tinig ng Pasko : The Araneta Center Christmas Special was aired last November 20, 2011 on ABS-CBN. The Event was made possible by Araneta Center, Smart Araneta Coliseum, ABS-CBN, Meralco, Pizza Hut, Dairy Queen, Taco Bell, Binibining Pilipinas Charities Inc., Gateway Mall, Ali Mall, Farmers Plaza and Farmers Market. Stay updated on latest Araneta Center updates! Like The Araneta Center on Facebook and Follow The Araneta Center on Twitter! wer do i watch this concert? the full view of this? please i want to hear this again. email me at hermanburser@yahoo.com. thankyou! the full video i mean.